LENEXA, Kans. 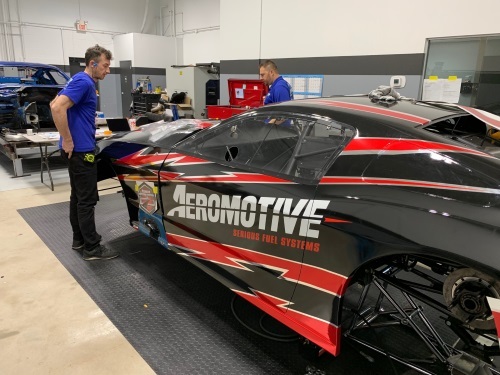 (March 6, 2019) –Steve Matusek had a vision for how he wanted his Pro Mod Mustang to look for the 2019 NHRA Pro Mod season. When the veteran standout got the chance to look at the finished product, it was like his vision had come to life. With a perfect mixture of a throwback to the start of Matusek’s racing career with the Mustang to the forward-thinking approach heading into 2019, the wrap and car are equal parts old-school and new-school. Adding a nod to Aeromotive’s 25th anniversary and a distinctive color scheme, and Matusek believes the car has the ideal look heading into a year with big expectations. In the end, Matusek ended up with a car he can call “an Aeromotive car.” He worked with the likes of Drag Illustrated Founder Wes Buck, DI Director of Design and Production Mike Carpenter, Jackson Lueg and Rod Burke on the design, making sure the car signified Aeromotive’s modern, outside-the-box approach. Personal touches like the chrome red and chrome silver added distinguishing touches to Matusek’s car and he couldn’t be more satisfied with the end result. 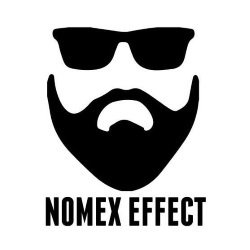 It is the perfect representation for the approach Matusek and Elite Motorsports are taking for the 2019 NHRA Pro Mod season, which starts next week in Gainesville. Nothing about their approach this off-season has been conventional and that’s just the way Matusek likes it. 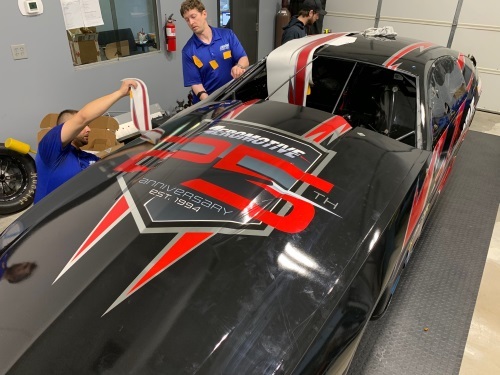 They’ve enlisted top talent like Justin Elkes and Modern Racing, as well as crew chief Shane Tecklenburg, and the entire Pro Mod operation at Elite Motorsports has been hard at work. Matusek and his team didn’t get a chance to race at last weekend’s World Outlaw Nationals in Orlando, generally considered the warm-up event for the NHRA Pro Mod season, but they will test this weekend in Valdosta. Matusek has big expectations for 2019, but the team is taking the long approach to the season. At the same time, everyone is excited to get to the track and put some of their outside-the-box theories to the test. It’s a jolt that that brings great joy to Matusek as he thinks back to the thrilling journey he’s been on for more than two decades. Aeromotive Inc. is a true high-performance aftermarket manufacturer specializing in fuel delivery and fuel system components for drag racing, off-road, late model, street rod and muscle car, tuner, sports car, marine and powersports. Utilizing aerospace tolerances and procedures, three generations of track experience, and a meticulous approach to engineering, Aeromotive Fuel Systems offers the pinnacle of performance fuel delivery. 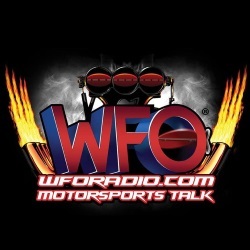 For more on Aeromotive, please visit www.aeromotiveinc.com.